From the “A” student in each period to the crowded detention Room, young voices echo “Can you help me?” Eyes looking for direction of a genuine connection, what can you do? What will you do? 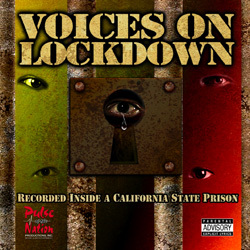 The audio CD Voices on Lockdown, recorded inside a California state prison, is designed to deter at risk youth from a life of crime, violence and ultimately prison or death (this is not a scared straight project). Our focus is on the concept of sound reasoning, understanding the repercusions of choices while reinforcing positive adolescent development. As previously stated, this project was recorded inside a California state prison with life term inmates participating as primary speakers with uncompromising authenticity. The power of the spoken word is the primary tool used in this somewhat unconventional format but the captivating concept is designed to magnetize a gravitation of open ears and an understanding of the prison microcosm while exploring it’s out of sight, out of mind existence. The 26 tracks are a variety of spoken word and movie-like soundscapes intertwined with jazz and hip hop music. Parental advisory – this album does contain explicit content. Although the subject content is graphic, the language appropriately maintains the authentic integrity of the message. Youth and adults alike will benefit from this project. Without judgemental overtones ask yourself the question “Where do we begin?”. Let’s start here, please give us your ear. We encourage you to listen to this unique audio project that has never been done before in history. This true, raw, uncut commentary is a contribution toward saving tomorrow’s future. Save a young life or invest in your own.